on the woodside. : *'natti light. 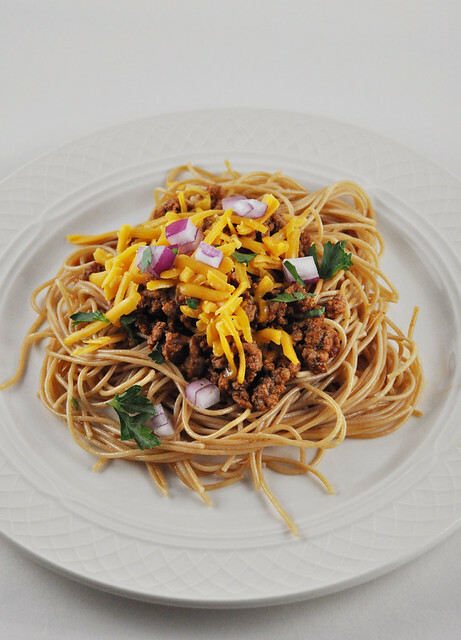 I ripped the recipe in a flash off The Enchanted Cook, partly motivated by a Diners, Drive-Ins and Dives episode I saw on the Cincinnati phenomenon of spaghetti topped with chili. Apparently at the Skyline you can order your spaghetti topped with their signature meat chili, and fancy it up either "3 way" (topped with shredded Cheddar cheese), "4 way" (Cheddar and beans or red onion), or "5 way" (cheese, beans, AND onions. This struck me as a touch lighter (all things being relative), thanks to the lean beef, whole-wheat pasta, and effervescent beer, plus the omission of beans—I adore them, but that's another starch on top of your day's value of carbohydrates. There was a moment when I wondered if a half cup of chili powder was a typo, but I soldiered on, and my taste buds were all the happier for it. This stuff was runny-nose spicy in the best possible way. I used a Negra Modelo because I knew I'd end up with five left over and that's the beer of choice 'round my 'hood, but any dark-and-frothy brew will do. I love that big, bold, stewy proper chilis have to bubble away for hours to marinate and thicken and develop their flavors, but I also love that you can throw something together in minutes that can approximate those same tastes on a weeknight and be happy as a pig in pasta. 1. Cook pasta in salted boiling water according to package directions; drain, and toss with a little oil to keep from sticking. Set aside. 2. In a large skillet, heat 1 tablespoon oil over medium heat, and add ground beef. Cook, breaking up with a wooden spoon, until browned and cooked through. Stir in salt and next 8 ingredients; reduce heat to medium-low and simmer 20 minutes. 3. 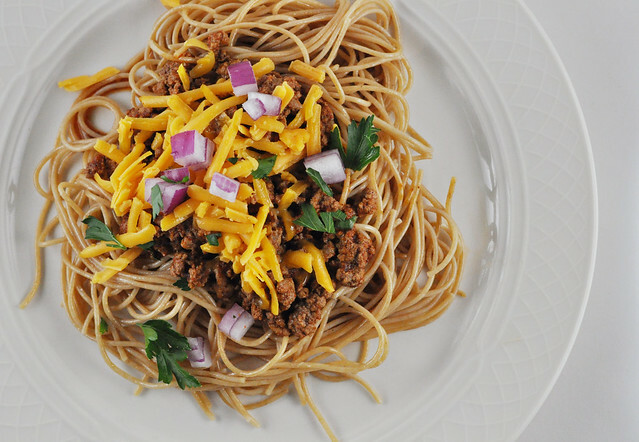 Top spaghetti with chili, cheese, and red onions; garnish, if desired. Makes 4 to 6 servings.